The Wrench is one of those special tools that modern day technology has gifted us with. They have come a long way and today, the best thing is that there are cordless wrench options. Cordless impact wrenches have a lot to offer given their small size and independent nature. You can use then to work in small spaces and just about anywhere. In addition to this, the cordless impact wrenches do not cause you to fatigue fast. That said, you should note that there are very many types of companies in the market including Dewalt and Ingersoll. These are the two top grossing company in the industry dedicated to providing quality over all else. Generally, the motors these wrenches come with are brushless which provide you with better performance and keep the unit from wearing fast. You can also read other product reviews such as air impact wrench, air ratchet, torque wrench, tap and die set. This is among the best electric impact wrenches there is in the market today. At just 6.4 pounds without the battery, the tool is balanced. Sure the weight is not the best that has been seen in other products, but what the DeWalt DCF899HB fails in weight more than makes up for with the power it comes packing. At a maximum torque of 700 ft-lbs and a breakaway torque of 1,200 ft-lbs the numbers are impressive. As a matter of fact, these are numbers you expect to see in a ¾ inch wrench. With such power, the 3 speed selector that this unit features will get to be used a lot especially when working on car and smaller bolts and nuts. It easily is the most powerful electric wrench in the market. DeWalt has a new look for this unit which makes it feel very solid. Over the mold handle, DeWalt has placed rubber for a better grip. The variable speed trigger is designed to be easy to control and highly precise even when set to the highest level. The unit also comes with a bright LED light that just might be too bright especially when you are working on a shiny surface like chrome or aluminum. The tool features a 5.0 Ah battery designed for professionals. This high capacity battery and brushless motor enables the tools to run with great efficiency for a whole day removing and tightening bolts. And even as the battery drains, the power delivered is even and strong. If you are one who needs to make quick changes, you will be pleased to note that the impact wrench comes with a Hog Ring anvil. Sure this is a small wrench. However, you should underestimate its power. The Ingersoll Rand W7150-K2 has more than earned its place on the list. With the 1,110 ft-lbs maximum torque rating, the unit is pretty impressive. But let us not forget the 780 ft-lbs reverse torque power rating which makes it the strongest electric impact wrench. The Ingersoll Rand W7150-K2 has the ability to remove crank and axle and lug nuts on trucks and tractors. Whatever task you have in mind, the Ingersoll Rand W7150-K2 is the device for the job. With a speed of 1,900 RPM the device only weighs 6.8 lbs. This has pushed many to refer to it as the mighty Inger. In addition to the speed, this cordless impact wrench also comes with variable speed and brake switches (electronic). This Ingersoll-Rand wrench is lined with an aluminum casing which helps to protect the internal components like the motor in the event it falls. Now with such torque and power, one would think that the battery drains fast. Well, much to your surprise, this is not the case. This device has the option of coming with two lithium ion batteries each with a 20 Volts rating. The device can run on one battery for about 4 hours. The batteries take 30 minutes to recharge and the device has an LED indicator of the charge status. As if all that is not enough the Ingersoll Rand W7150-K2 features a hog ring connection which enables one to make fast changes of sockets. 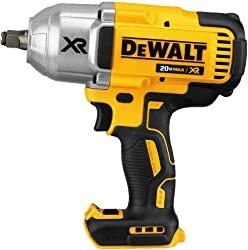 Air powered impact wrenches are the kings and queens of removing and fastening lug nuts but the DeWalt DCF889B is by far the best ½ impact wrench. This is more so in situations that you do not want to sacrifice the products durability and power of the device. For the cost, size and maneuverability, the Dewalt DCF889B is amazingly powerful. This tool is able to deliver 400 ft-lbs of torque at a maximum and has a wide range of fastening applications. With such kind of power, this cordless impact wrench will have little or no trouble removing any bolt or nut that they are tasked to work on. 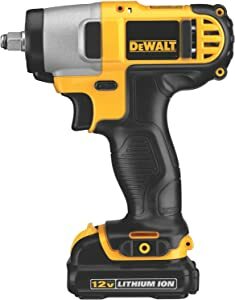 At a first glance, you could easily mistake the DeWalt DCF889B for a power drill. 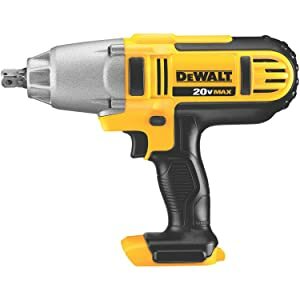 But after you realize the power that the device comes packing, coupled with a simple design and improved maneuverability, you will agree that indeed it is the best electric impact wrench there is. The impact wrench measures 5.8 pounds which is very light. Some of the device’s users have gone on record to state that they hardly noticed the weight when they were working. The ergonomic handle also provides for maximum control and effort while the unit is in use. The DeWalt DCF889B features a variable sped rigger as well as an electronic brake that is similar to the ones present in some top grossing drills on the market. With such features, you have great control over the device itself. You can be sure not to break it while you are tightening bolts. Last but definitely not the least is the fact that the device is fitted with a tough magnesium gear casing and a metal transmission. With such materials used in the construction, you can be sure that the device will last long. For the features and benefits you stand to gain with this impact wrench, you will be pleased to note that it is not insanely priced. This is yet another cordless impact wrench from DeWalt that has earned a slot in our listings. The DeWalt Bare-Tool DW059HB like other products form this company is one of a kind. To start us off, the impact wrench measures a whopping 5 pounds only which is perfect. With such weight, using the DeWalt Bare-Tool DW059HB even for prolonged hours will be a breeze. But even though the tool is lightweight, you should not confuse it for being weak. If anything, the DeWalt Bare-Tool DW059HB is a powerful force to reckon with. It has 300 ft-lbs for maximum torque meaning that the device can work on a wide range of heavy duty tasks with great efficiency. On any task you us the DeWalt Bare-Tool DW059HB, you will be a recipient of a speed within the range of 1,650 RPM and 2,600 RPM. This is much more that what many devices in the same class can offer. Adding to this, the DeWalt Bare-Tool DW059HB features a rocker switch design which makes everything easy and fast. For a device with such great power, you might fear that it may come with a powerful kickback as well which might be a safety hazard. Well in the case of this device, the truth is quite the contrary. The DeWalt Bare-Tool DW059HB comes with a heavy duty impacting mechanism that directs the torque with great precision and with minimal kickback. This increases your efficiency as you are hard at work. The device also comes with a Hog Ring Anvil which is perfect especially for those individuals who are looking to have quick and easy socket changes. As for the price, you need not worry yourself as the device is reasonably prices when you consider the features and power. The Tradespro 837212 has made it to this list for a bunch of reasons. 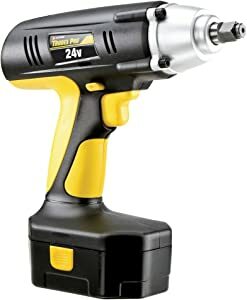 However, at the top of the list of these reasons includes the fact that Tradespro, the company, managed to reduce the price of this impact wrench over the years and still provide enough power for many of the applications of the device. The device comes packing 240 ft-lb in torque. Agreed, this is not the most impressive we have seen, but it surely is enough to get the job done even though the process might take a bit longer than with other devices. When dealing with cheaper products, especially electronics, many people seen to be very wary of their quality and durability. However, this is not the case with this device. While the Tradespro 837212 might not serve you for an entire decade, it still will give you some considerable amount of service. Users of this product have in the past gone on record to state that the Tradespro 837212 provided them with service for a long time – longer than two years. That said, the Tradespro 837212 weighs 10.2 pounds. For some this weight may be quite heavy to work with but when you consider the design, most of the issues that arise as a result of being heavy like uneven balancing and fatigue are to a great extent evened out. The Tradespro 837212 comes is powered with a battery that has a rating of 24 volts. This is better than the ratings on most products in the market. With such battery rating, you can be sure that the tool will last longer when fully charged. By now you surely must have noticed it. The DeWalt has a lot to offer in quality and features as well. The company does not hold anything back when it comes to delivery. 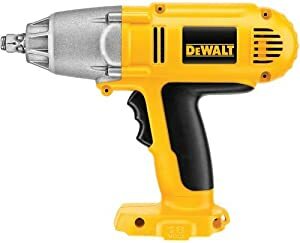 That said, The DeWalt DCF813S2 measures only 6 ¼ inches long and is designed to fit in tight spaces where the normal sized impact wrenches cannot. The size of this device also means that you are in a position to get maximum leverage to use the maximum torque rated at 1,150 inch pounds. Adding to this, the device features LED lights that are built into the body. These LED provide for better lighting without shadows. 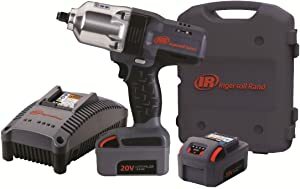 Not only is the cordless impact wrench compact, the device is also lightweight weighing an impressive 2.3 pounds that is distributed evenly in the ergonomic body and the battery pack. With such low weight, the tool is easy to lift. The Hog ring anvil makes it easy to change sockets. With this impact wrench, you will also be a recipient of long lasting batteries that are fast charging. In total, the wrench features two lithium ion battery packs each with a 12-Volt maximum rating. The time they take to recharge is between 30 – 60 minutes. Lastly, you will be pleased to note that this device comes with a limited warranty. If anything, this goes to show the trust the company has in the products that it produces. 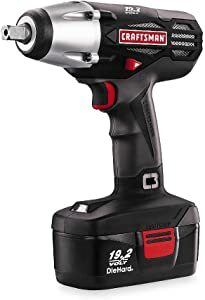 Whether you will be working on the hood of your car or have some fixing to do in your house, this Craftsman C3 impact wrench will help you get the job done in the shortest of times and in a most professional manner. With this cordless wrench, you will not be hindered by cords. The Craftsman C3 can provide you with 200 ft-lb of torque at maximum while running on a 19.2-Volt battery. While the figures might not be as high as those on other devices listed above, the Craftsman C3 still can hold its own when the need arises. The handle has been designed to provide ample comfort and balance to ensure that while you are working you do not fatigue fast especially when you are working on a long project. The fact that the tool measures only 7.7 pounds also contributes to the reduced fatigue when working with this tool. The 7.7 pounds it weighs also makes the Craftsman C3 highly portable and best used as a roadside accessory when you need to change tires while on the go. Aside from that, the unit comes with inbuilt LED that enables you to work even in areas with not so good lighting. On shiny surfaces like polished aluminum and chrome, the LED might seem too bright. It is usually very easy to fall in love with cordless impact wrenches given their convenience. But is the convenience of working anywhere the only thing that these types of wrenches have to offer? Well, not quite. There feature a host of benefits that many have not had the chance to explore yet. First and foremost, they are pretty compact. They are designed to be lighter and compact. As a result of their miniature design, they can fit in tight spaces and help you get the job done faster than you can blink. Well not exactly that fast, but you get the point. Second, these are very powerful devices. On average, they can produce about 133 ft-lbs of torque though there are some that can produce way more than that. This is possible courtesy of the hammer and anvil mechanism that they come packing. With this mechanism, the impact wrench is much more ruthless and effective. Having enough torque to loosen a fastener is one of the most important factors that you should consider. Before you decide which impact wrench to pick, you should first decide how much torque the task at hand will need. You do not want to have a wrench that cannot get the job done. There are some wrenches that are notably heavier than others. If yours is a short project, then weight might not exactly be a determining factor. However, if you will be working on long projects, fatigue is bound to set in. You will get to a point you are happy you chose a lighter wrench. Ideally the smaller the impact wrench the better. You should, however, note that most times you will have to trade size for torque or vice versa. A smaller wrench will allow you to work in tight spaces, but you will have to sacrifice some torque. Finding a perfect balance between the two is best. The cost of cordless wrenches varies greatly and depends on the features and technology used in a wrench. The more the features, the costlier the wrench is and vice versa. Though there are some that come with impressive features and still are affordable. Find a balance between the cost and quality to get the best deal. Aside from the above-mentioned factors, you need to consider the drive size, the ergonomics and design, torque adjustment and warranty.